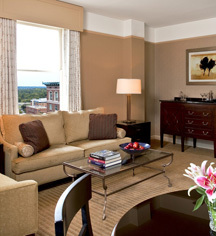 Affording a soothing design, adopting classical elements of the 1920s, the 200 spacious guestrooms and suites at The Westin Poinsett boast convenient luxuries and sumptuous furnishings. All accommodations feature the opulent Westin Heavenly Bed® that offers 10 layers of pure decadence, for the perfect night's sleep. The bedding includes the renowned pillow-top mattress, exclusively designed to create the perfect foundation for deep, renewing sleep, with plush pillows, crisp white sheets, and a fluffy duvet for a blissful rest. Some guestrooms include a sitting area and a view of the courtyard. 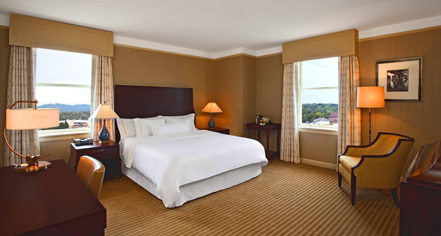 A proud member of the South Carolina Green Hospitality Alliance and a Breathe Westin® hotel, The Westin Poinsett offers the Make a Green Choice program which grants guests the option to decline daily linen and terry change service.